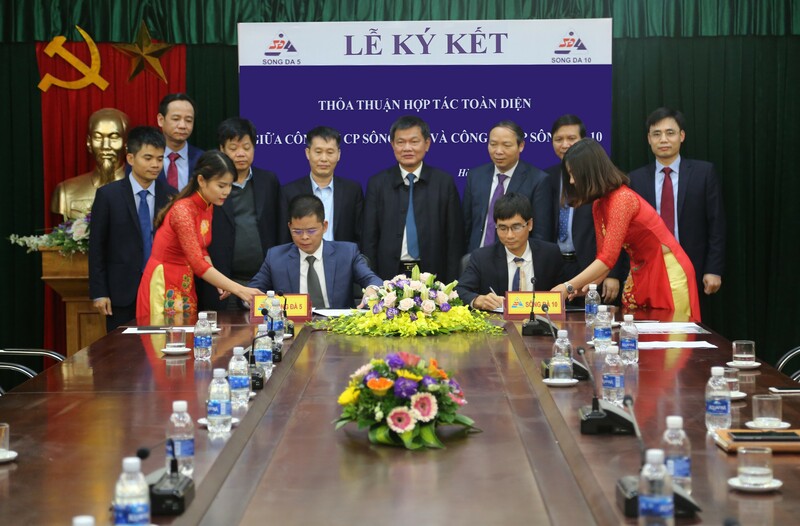 On 15th January 2019, the Signing Ceremony of Comprehensive Cooperation Agreement between Song Da 5 Joint Stock Company (“Song Da 5”) and Song Da 10 Joint Stock Company (“Song Da 10”) was held at the Head Office of Song Da Corporation. Be members of Song Da Corporation, Song Da 5 and Song Da 10 have a long-term good traditional relationship. During the past time, Song Da 5 and Song Da 10 have collaborated in execution of important national projects. The cooperation agreement signing will create opportunities to increase corporate value and improve their capabilities and strength, create an aggregate power to bring a higher position for them in investment and construction in domestic and overseas. The signing ceremony witnessed the attendance of Mr. Ho Van Dumg – Deputy Secretary of Song Da Corporation Cummunist Party, Chairmain of Management Board – Song Da Corporation – JSC; the attendance of Mr. Tran Anh Duc – Chairman of Management Board of Song Da 5, Mr. Tran Huu Hung – General Director of Song Da 5; Mr. Tran Tuan Linh Chairman of Management Board of Song Da 10, Mr. Tran Huu Hung – General Director of Song Da 10 and other departments’ leaders along with the attendance of Song Da 5 & Song Da 10’ representatives. 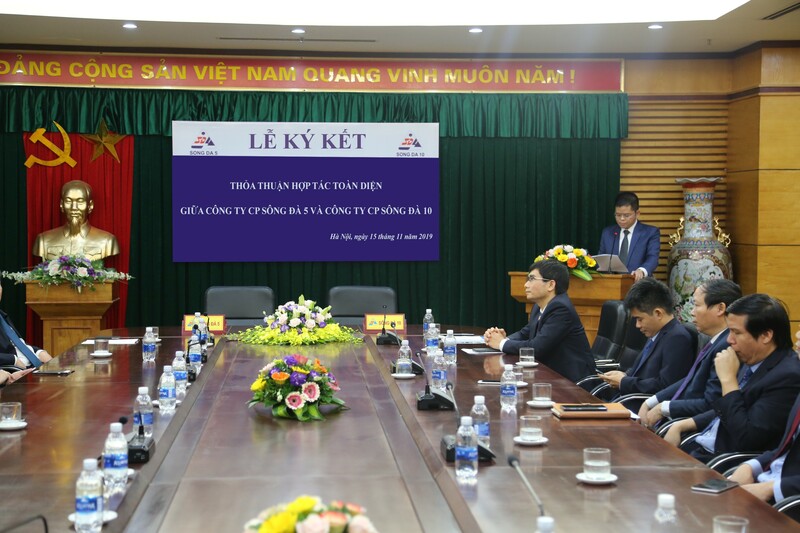 Mr. Tran Anh Duc – Chairman of Management Board of Song Da 5 JSC gave a speech in the Ceremonny: He stated Song Da 10 and Song Da 5 became leading subsidiaries of Song Da Corporation. They expected toward a long term cooperation in a various projects and fields, both in domestic and foreign countries. 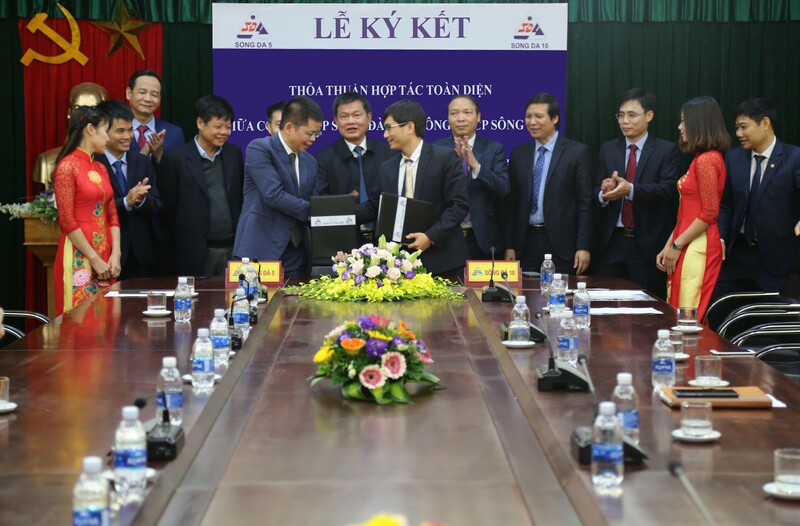 The signing ceremony of this cooperation agreement between Song Da 5 and Song Da 10 was a vital and suitable for their mutal development direction, improvement and implement thier capabilities and based on it, the parties would create a strong construction contractor joint venture which was enough power to compete with other rivals for contract awarding. Moreover, in the ceremony, Mr. Tran Huu Hung – General Director of Song Da 5 Joint Stock Company and Mr. Tran Van Tuan – General Director of Song Da 10 committed to fulfill all agreed provisions; ensure benefits; maintain and improve the good cooperation relationship and contribute for the development of Song Da Corporation. 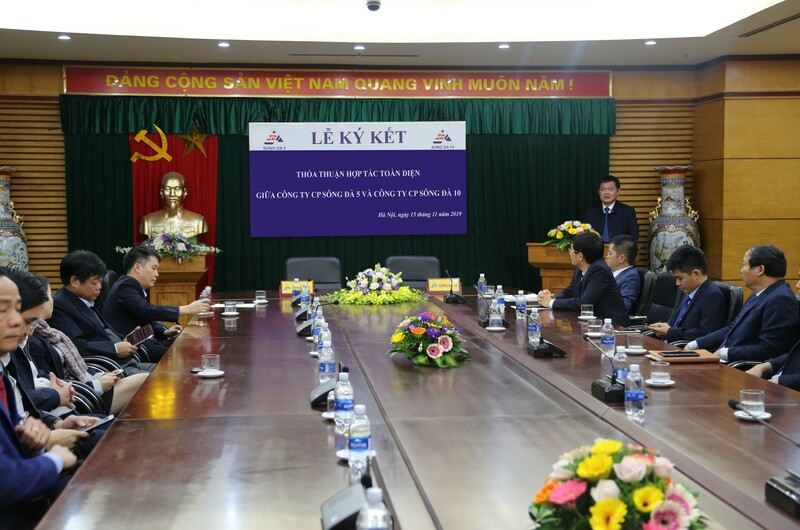 Mr. Ho Van Dung – Chairman of Song Da Corporation on behalf of their mother company stated that Song Da 5 and Song Da 10 were strong subsidiaries of Song Da Corporation and express his pleasure in attending this signing ceremony and witness the close cooperation relationship of the Parties. Song Da Corporation will facilitate and collaborate with the Parties in realization all agreed provisions in the comprehansive cooperation agreement.